Capacity Percent Default is the default availability percent for project resources. Availability in hours is calculated from the total hours on a resource personal calendar, multiplied by this value. For example, a 40 hour per week work calendar, times 75% means the resource has 30 hours available for the week. The default can be overridden at the resource level. Utilization Percent Default is the default utilization percent for project resources. Utilization percent is used as a target or goal amount to be utilized across all projects. Utilization values can be reported on the cross project resource allocation report. The default can be overridden at the resource level. Capacity Percent Max is the default maximum availability percent allowed. Allocations exceeding the maximum value generate an auto-alert (if enabled) for over allocations, and/or a warning when adding or editing a task on an active project (if enabled). Enable Error on Over Allocation enables an error message to be presented when a task is added or edited on an active project that will cause over allocation for the resource. Work Percent Complete Types when selected, enables resources to select from a drop-down of preset descriptions instead of inputting a number (percent). The selections and their corresponding percent complete values are configured under Work Percent Complete Types. Enable Permissions for PM's grants a project manager rights to administer folder/item permissions and administration properties. They will have these rights for any project where they are assigned as a project manager. All project managers should be properly trained as system administrators if this option is selected. Project Target Budget enables the target budget information to be entered on the project and included in reports. This option must be checked for the Target Budget Information tab to be available () when adding a new project or editing an existing project. Estimated Hours & Total enables the tasks to track estimated values in addition to work. This may be used for tracking and comparing the original estimated hours and fixed costs to work hours and work expense. This comparison is sometimes required if the work hours are expected to change throughout the course of the project and the original estimate is desired for variance reporting against the estimate. Proposed Hours & Total enables the tasks to track proposed values in addition to work. This may be used for tracking and comparing the original proposed hours and costs to the work hours and cost. This comparison is sometimes required for tracking proposal values which will likely differ from work taking place on a project. For example, a proposal may be to bill for fewer hours than the planned work if the work for the project has value above and beyond that which the customer is directly funding (i.e. an improvement to a product or process which will provide a return beyond the date of this specific project's completion). Task Permission Add/Change Override for Project Managers enables project managers on the project to add and change tasks even if the project's permissions, often inherited from the parent folder, do not allow the assigned project manager add and change permission. Task Permission Add/Change Override for Project Schedulers enables project schedulers on the project to add and change tasks even if the project's permissions, often inherited from the parent folder, do not allow the assigned project scheduler add and change permission. Task Permission Delete Override for Project Managers enables project managers on the project to delete tasks even if the project's permissions, often inherited from the parent folder, do not allow the assigned project manager delete permission. Task Permission Delete Override for Project Schedulers enables project schedulers on the project to delete tasks even if the project's permissions, often inherited from the parent folder, do not allow the assigned project scheduler delete permission. Project Default State selecting will default all new projects to the Active state instead of the Planning state. 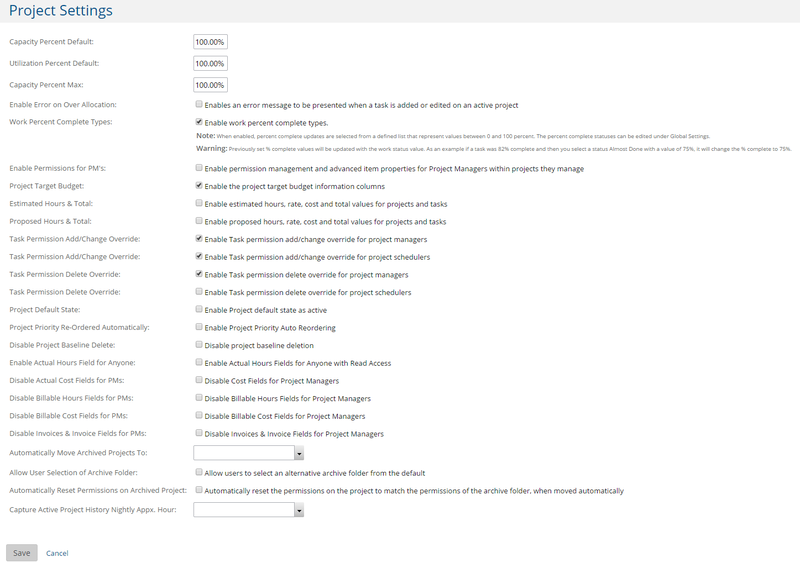 Project Priority Re-Ordered Automatically will reorder all project priority values with lessor and equal values to any new priority set on a project. Disable Project Baseline Delete selecting will prevent baselines saved to any project from deletion. There is no project override for this setting. To delete a baseline this setting must not be checked. Enable Actual Hours Field for Anyone will allow the actual hours data in the project task lists to be read by anyone with read access regardless of restrictions the user might otherwise have for viewing other budget-related data. Automatically Move Archived Projects To selecting a folder will change the location of the project to the designated default folder when saving the project state to Archive. Disable Actual Cost Fields for PMs will restrict the actual cost data from viewing and/or editing by project managers who are otherwise given full control to edit and view actual cost information. Disable Billable Hours Fields for PMs will restrict the billable hours data from viewing and/or editing by project managers who are otherwise given full control to edit and view billable hours information. Disable Billable Cost Fields for PMs will restrict the billable cost data from viewing and/or editing by project managers who are otherwise given full control to edit and view billable cost information. Disable Invoices & Invoice Fields for PMs will restrict the invoice data from viewing by project managers who are otherwise given full view access to invoice data. Allow User Selection of Archive Folder works with the above setting so that the user changing the project state to Archive is prompted to choose an alternative folder instead of the default archive folder. Automatically Reset Permissions on Archived Project will use the permissions from the parent folder and force those permissions through the archived project immediately after moving the project. Capture Active Project History Nightly Appx. Hour: selecting a time from the drop-down will cause the system to capture project history nightly at that time.